APP is one of the most controversial pulp and paper companies on the planet. So why have two of its paper products been awarded the EU Ecolabel? By Chris Lang. Published in WRM Bulletin 153, April 2010. The European Commission claims that the EU Ecolabel is only awarded to “the very best products, which are kindest to the environment”. But when the EU Ecolabel has been awarded to Golden Plus and Lucky Boss, two brands of photocopy paper manufactured by Pindo Deli, a subsidiary of Asia Pulp and Paper, this claim is greenwash. 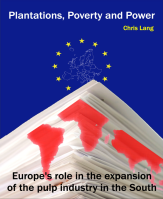 “EU Ecolabel allows forest destruction: The case of Pindo Deli,” is the title of my latest report, recently published by FERN. Despite the EU Ecolabel, which was awarded in 2006, the logging and plantation operations associated with Pindo Deli are extremely destructive and in some cases may not even be legal under Indonesian law. Pindo Deli is a paper manufacturing company with two paper mills in West Java, producing around one million tonnes of paper products a year. Around 80 per cent of the pulp used in Pindo Deli’s paper mills comes from two massive APP pulp mills in Sumatra: Lontar Papyrus and Indah Kiat. Vast areas of forest have been cleared to supply the raw material to these pulp mills. Two forestry companies, PT Arara Abadi and PT Wirakarya Sakti (PT WKS), supply timber to the pulp mills. Both are part of the Sinar Mas Group, the company that owns Asia Pulp and Paper. PT Arara Abadi has an appalling record of human rights abuses, documented in detail in a 2003 report by Human Rights Watch, titled “Without Remedy”. In November 2009, David Gilbert of Rainforest Action Network visited PT WKS’s logging operations in Jambi province, Sumatra. Gilbert travelled to the edge of PT WKS’s concession, bordering Bukit Tigapuluh National Park. “Private security forces turned us away,” he says. “Just beyond the gates, biodiverse lowland rainforests are being illegally logged by Asia Pulp and Paper.” Gilbert saw around 100 trucks leaving the forest, “headed to the nearby APP pulp and paper factory.” That factory is Lontar Papyrus. About 10,000 people live in PT WKS’s concession area, including about 500 members of the Orang Rimba indigenous group. The Orang Rimba’s livelihoods are being devastated by PT WKS’s logging operations. A 2008 report by a group of NGOs, including WWF Indonesia, found that PT WKS was logging in an area of forest where orangutans had recently been re-introduced. The NGOs documented the destructive logging and questioned whether PT WKS’s operations in Bukit Tigapuluh were legal. I tried to find out how on earth the EU Ecolabel could have been awarded to a company involved in this level of destruction. To get the Ecolabel, Pindo Deli had to convince one of the EU’s “Competent Bodies” that it complied with the Ecolabel’s criteria. In this case, the “Competent Body” was a French company called AFNOR. I wrote to AFNOR to make a formal request for the assessment report carried out before the Ecolabel was awarded and any audits that had been carried out since the award. AFNOR declined to respond. I wrote to Pindo Deli and APP to ask, among other things, what evidence the company could provide that its raw material comes from “sustainable forest management”, as required to comply with the Ecolabel criteria. Pindo Deli and APP declined to respond, even when I sent a draft copy of my report and invited them to provide a comment and offered to include the comment as an annex to the report. APP did respond after the report had been published, but failed to address the allegations of destructive logging operations in the report. I wrote to the European Ecolabel Helpdesk to ask what information about the assessment is publicly available. None, it turns out. “I doubt that the assessments are available to the public since it might contain private information, for example regarding the composition of the products, that producers might not want to disclose,” Camille Ouellete from the Helpdesk told me. “Unfortunately, I fear you will not be able to obtain those documents,” she added. ENDS Daily (a news service covering European environmental issues) reports that the European Commission’s environment department will ask AFNOR to investigate and “act in response to these severe accusations”. Whether AFNOR’s investigation will be made public, however, is not clear. “When licenses are found to be in breach, which happens occasionally, they are taken away immediately,” the environment department told ENDS Daily. There is little doubt that APP’s operations are not sustainable, nor do they comply with the EU Ecolabel criteria. EU’s greenwashing of this destructive company should stop. The EU Ecolabel should be withdrawn from Pindo Deli’s photocopy paper. “What is the Ecolabel?, European Commission website. Journalist and writer Fred Pearce agrees. See Fred Pearce (2010) “The deflowering of the EU’s green logo“, The Guardian, 15 April 2010. 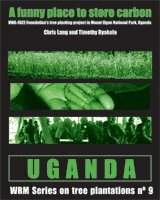 The report is available on FERN’s website. PT. Pindo Deli Pulp and Paper Mills, APP website. 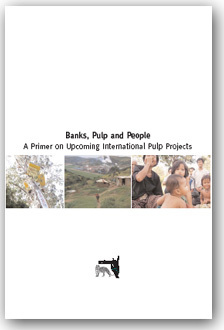 Mark Rushton (2009) “APP Indonesia – A giant poised on the edge“, Pulp and Paper International Magazine, 31 December 2009. 18-21 per cent non-fibre fillers. Source: APP (2007) “Growing a sustainable future“, Environmental and Social Sustainability Report for Indonesia, APP, page 76. 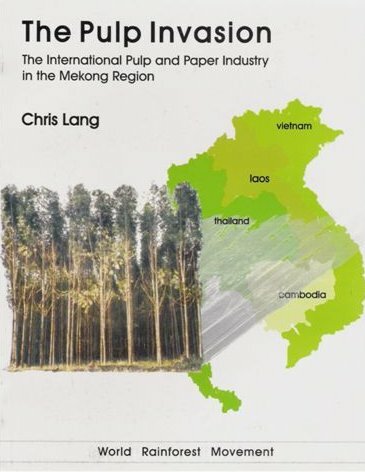 See, for example, Chris Lang (2008) “Indah Kiat, Asia Pulp and Paper, Indonesia: Deforestation, debt and destruction of livelihoods“, chapter in “Plantations, poverty and power Europe’s role in the expansion of the pulp industry in the South”, World Rainforest Movement, December 2008. “Without Remedy: Human Rights Abuse and Indonesia’s Pulp and Paper Industry“, Human Rights Watch, January 2003. 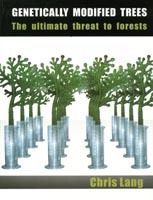 David Gilbert (2009) “Indonesian NGOs reject forest certification of one of Asia Pulp and Paper’s industrial forest plantations“, The Understory, Rainforest Action Network’s blog, 24 November 2009. WWF-Indonesia, KKI WARSI, Zoological Society of London, Frankfurt Zoological Society and Yayasan Program Konservasi Harimau Sumatera (PKHS) (2008) “Asia Pulp & Paper (APP) Threatens Bukit Tigapuluh Landscape“, Report of investigation findings, 8 January 2008. “FSC dumps Asia Pulp and Paper – but who was to blame?” FSC-Watch, 10 January 2008. I wrote to Patricia Proia at AFNOR on 14 January 2010 and again on 21 January 2010. I made a formal request for the following documents: 1. The assessment report that AFNOR carried out before Pindo Deli was awarded with the EU Ecolabel; and 2. Any audits that AFNOR had carried out since the Ecolabel was awarded, to check whether Pindo Deli remains in compliance with the Ecolabel criteria. I did not receive any reply. I wrote again on 18 February 2010. I wrote to Tien Johanna at Pindo Deli on 27 January 2010 with a series of questions about Pindo Deli and about the awarding of the EU Ecolabel. I wrote again on 18 February 2010. I sent a draft copy of the report on 30 March 2010 to give APP the opportunity to correct any factual errors and to provide a two-page response, which would form an annex to the report. I copied the emails to APP’s Sustainability and Stakeholder Engagement department and to the Manager – Europe, APP Sustainability & Stakeholder Outreach. 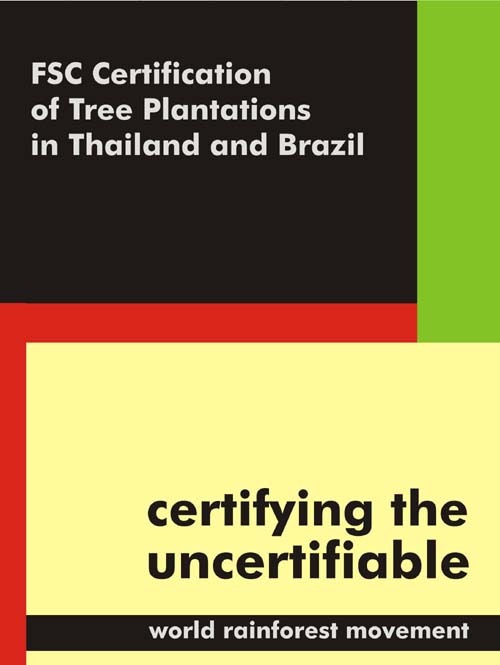 APP (2010) “Open Letter to Stakeholders In Response to FERN’s Report: EU Ecolabel allows forest destruction“, APP, Jakarta, 13 April 2010. Email from Camille Ouellette to Chris Lang, EU Ecolabel Helpdesk, 22 January 2010. “Report questions European ecolabel’s integrity“, ENDS Daily, 12 April 2010. Deforestation is a major problem that mankind must solve soon!